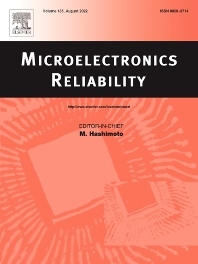 Microelectronics Reliability, is dedicated to disseminating the latest research results and related information on the reliability of microelectronic devices, circuits and systems, from materials, process and manufacturing, to design, testing and operation. The coverage of the journal includes the following topics: measurement, understanding and analysis; evaluation and prediction; modelling and simulation; methodologies and mitigation. Papers which combine reliability with other important areas of microelectronics engineering, such as design, fabrication, integration, testing, and field operation will also be welcome, and practical papers reporting case studies in the field and specific application domains are particularly encouraged.